As soon as CJ found out his next race was at an airfield, all sorts of visions filled his head and to be honest also my own. Well, Alconbury Airfield in Huntingdon, Cambs was not exactly the easiest place to locate on your sat nav. We firstly arrived at an active American military base with checkpoint soldiers holding rifles and resembling a scene out of Homeland before we eventually got relocated to our destination. This was also an inaugural race for his new club East London Vélo so he wanted to do well for the Black, White and Yellow jersey. Anyway, after much ado finding the yellow brick airfield we ended up parking along a dis-used runway which would form part of the circuit straight. CJ took to his steed and soon spotted some familiar faces and as such quickly summed up that he was going to have to go hard again against the usual suspects second year under ten pedalers. 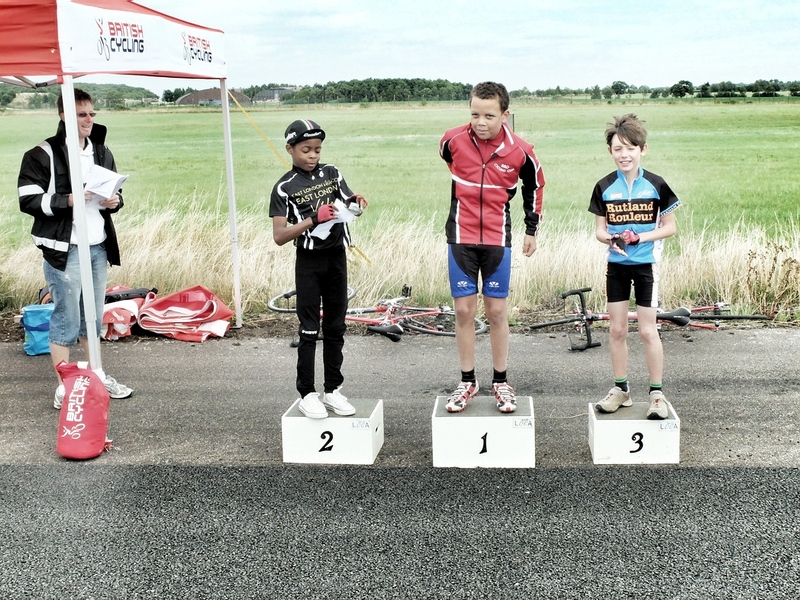 Mitchell Lacey (Barking & Dagenham CC), Joe Kiely (Welwyn Wheelers CC) and James Fraser (CC Ashwell) were on the line alongside CJ as he wanted to keep tabs on them. An estimated 15 racers were in attendance but an unfamiliar jersey was also bunched in close from an unknown to us club named Rutland Rouleur. CJ wondered what he was going to bring to the party and it wasn’t long after the start before he found out. Ten minutes plus two laps was the order of the morning and by the first lap all the aforementioned racers were in contention as they headed out of view from the runway. Soon they came back into shot and the only change was James Fraser had dropped a yard of the pace which he couldn’t make up. CJ was comfortable covering the Barking and Welwyn attacks and even launched a rare one of his own. The Rutland rider (Owen Lightfoot) held in the four boy group and as an unknown quantity I wondered what he would now bring to the last lap as the bell sounded. Joe Kiely soon attacked before being checked back into the group for Mitchel Lacey to then turn up the heat. 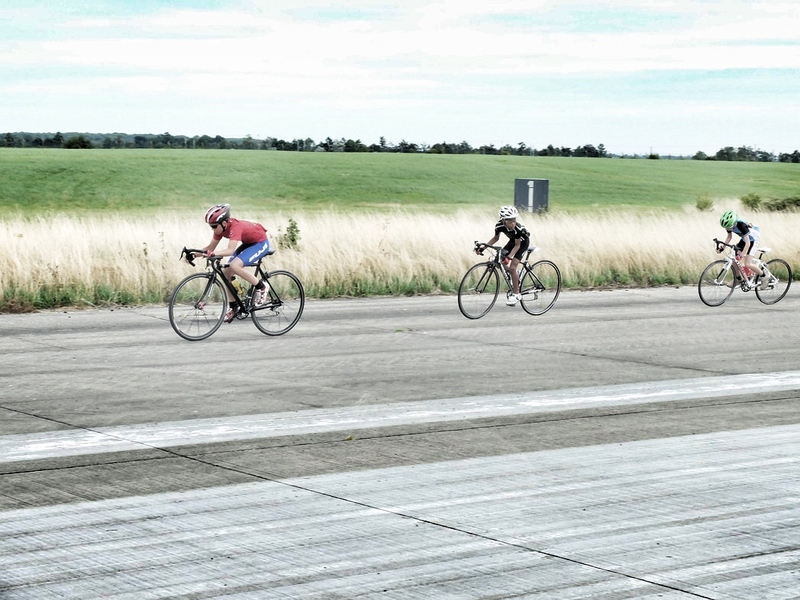 CJ moved with the increased pace but could only maintain the status quo in second position with nothing to challenge and rolled in a few bike lengths behind under no real threat from the Rutland racer. Another good day in the saddle….. CJ was happy to point score for his new club and stated the circuit was technical and great in parts so would race there again with no hesitation.